With Bubbles more mobile now, it has been getting harder to get her to sit still as I read to her. Still, she never fails to clamour up to me when I ask her to 'sit on Mummy's lap' to listen to a story. 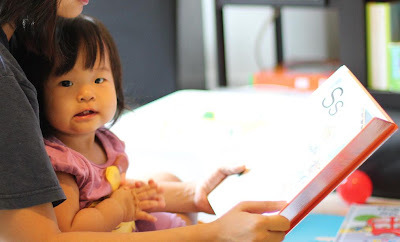 Thankfully, she also often attempts to mimic what I say, clap her hands, raise her arms in the air with excitement, pat the pictures, or bop up and down to the rhythm of my reading. Although I really enjoy reading aloud, I am mindful that I have been exposing her mainly to the English language. I bought a number of Chinese books from an online seller but found to my dismay that without Hanyu Pinyin, I have great trouble recognising many of the words. I hope I can do better so Bubbles wouldn't have to struggle with the language the way I did in school. Do shoot me a mail if you have good Chinese books to recommend! How else can I help her learn and enjoy Mandarin? get those kind of primary school chinese 'newspapers' that has got tons of pictures? Newspapers?! I've never seen those! I've never been able to find good looking Chinese board books for infants. For me, infants must only come into contact with board books because I cannot tolerate them tearing up my books. Hence I only started very recently (this year in fact) to read Chinese books to my older boy when I transited him to soft cover books. Prior to this, he had some 'exposure' to the language in school already, though he still very much prefers me to read in English. We're now reading the 小乐乐丛书 series from Pan Asia Publishing Pte Ltd. Comes with hanyu pinyin. I don't think they carry it at places like Borders/Kino though. Mine are from a colleague who used to subscribe to them for her children. Thanks for sharing! I'll continue my search. Yes, we've since learnt the hard way and put the non-board books aside. She still loves to tear paper though! And tissues. I think it is the sound of tearing she likes! haha. Mine love tearing tissue paper too. If you're looking for nice Christian/bible board books (and you don't want to get them online), you can try the Precious Thoughts outlets. Weird that they sell books, but I've seen them being sold at the one in Bukit Batok, and somewhere else which I can't remember.